A new bike has just arrived here at road.cc HQ in the shape of this affordable aluminium road bike from Scott: the Speedster S55. Of course, ‘affordable’ means different things to different people but at £749 the UK-exclusive S55 is well within the range of a Cycle to Work scheme. If your employer has one set up, you could get the bike plus a bunch of essential accessories and still come in comfortably under the £1,000 threshold. Don't confuse this bike with the S30 that we've also got in for review at the moment, by the way - it's just that we're Scotted right up at the moment. At the heart of things you get a 6061 alloy frame with double-butted tubes. If you don't know about such things, that means the thickness of the tubes varies from the middle to the two ends. The walls are thinner through the central section to save weight while material is retained at the ends where it’s needed for strength. Up front, that fork comes with carbon legs and there’s an alloy steerer tucked away inside the head tube. That’s a standard combination on a road bike of this price. The reason the S55 is a UK-exclusive is that it has been given extra clearance for fitting mudguards. 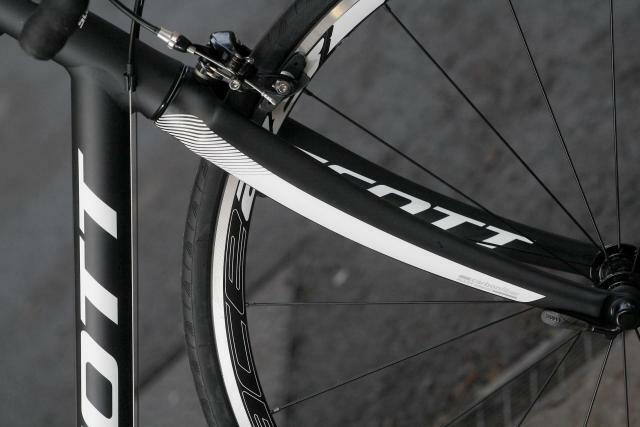 If you’re looking for a year-round workhorse – maybe you want a bike you can commute on, maybe you want something to train on through the winter – you can easily fit full, traditional-style mudguards thanks to the slightly lengthened chainstays and fork and Scott’s own brake callipers. 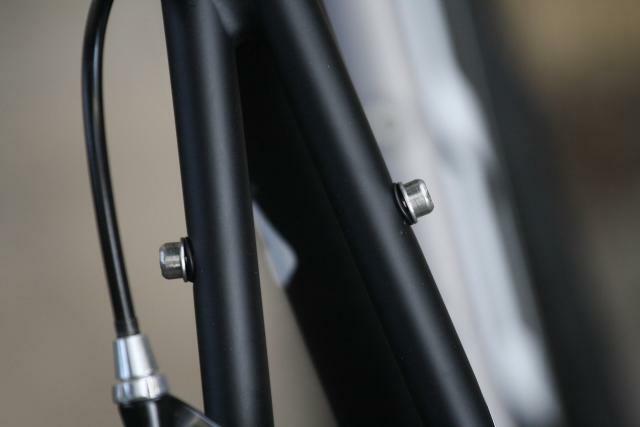 You get eyelets for mounting a rear rack directly on to the frame as well. That might come in handy if you’re thinking of riding to work; sticking a pannier or rack-top bag onboard is a whole lot easier than carrying a bag on your back if you’re lugging anything heavy to and from the office. The S55 has a ride position that’s a little more upright and relaxed than you’ll find on Scott’s high-end race bikes, although it doesn’t contrast wildly. The head tube is a touch longer (19cm on our XL/58cm test model, compared to 18cm on a high-end Foil) and the top tube is a little shorter (57.5cm as opposed to 58cm). This is still a bike built for efficiency, though. It’s just a little less extreme than a race machine. Not only does that mean that getting down on the drops asks less of your back, your slightly more lofty head position will give you a better view of traffic – another bonus if one of this bike’s duties is to ferry you through rush-hour traffic. 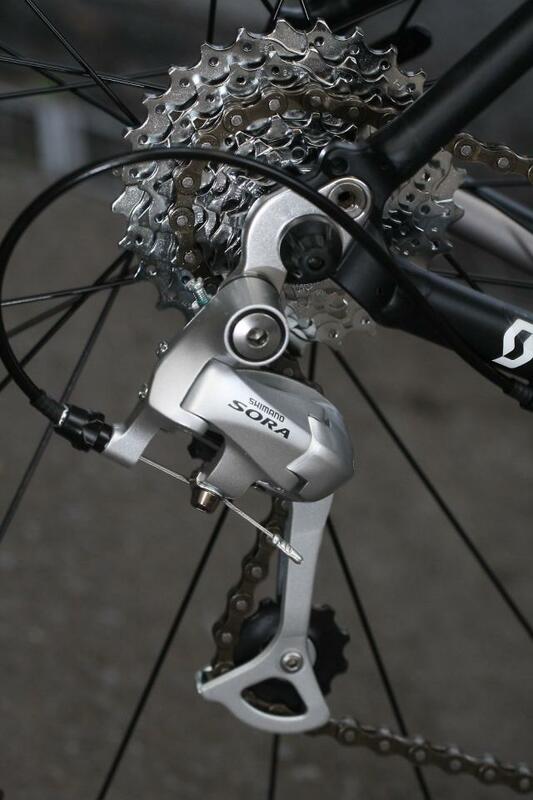 The groupset components are mostly coming from Shimano’s 2300 and Sora ranges. The compact chainset matched up to an 8-speed cassette gives you some hill-friendly gear ratios. 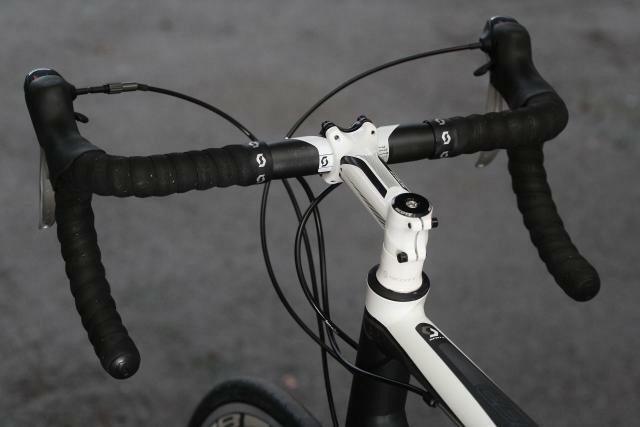 Shifting between gears uses a different system from Shimano’s higher-level groups. 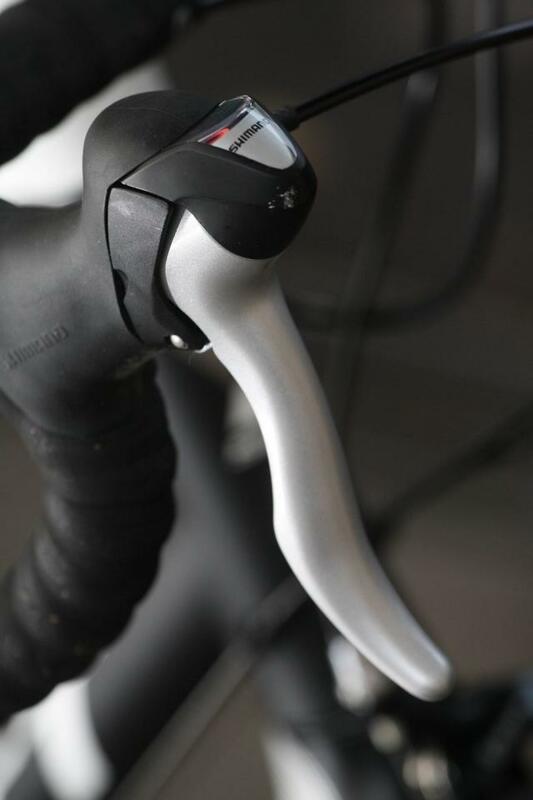 Rather than having a lever that sits behind the brake lever, you get a small thumb lever on the inside of the shifter body. You soon get the idea, and a little optical display at the front of the shifter shows you which gear you’re in. 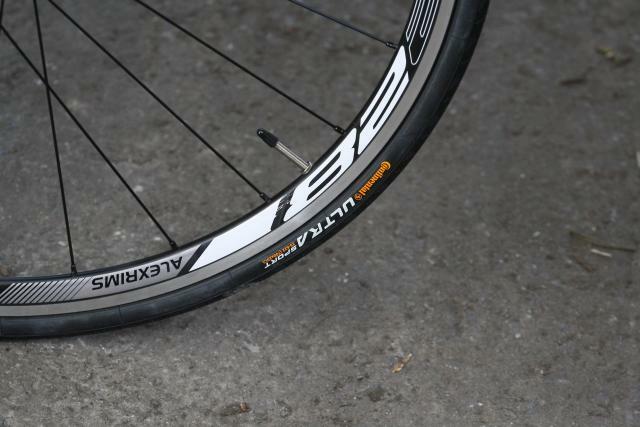 You get Alex rims and Continental tyres but most of the other components are Scott’s own. All up, our S55 weighs in at 9.7kg (21.3lb)… And that’s about all we can tell you for the time being. We’ll be back with a full ride report as soon as we’ve clocked up the miles. In the meantime, if you want more info visit Scott’s website.